The Mont’e Prama Giants (in Sardinian language “Sos Zigantes de Mont’e Prama”) are nuragiche sculptures in the round. Just a few meters from the Sa Marigosa OP, a team of archaeologists and scientists is bringing extraordinary discoveries to light, which attract scholars from overseas. Warrior priests of over two meters tall, boxers with rimmed eyes, archers busts, Titan legs with carved shin guards continue to surface after a 2800 years’ sleep. Every week new fragments emerge, new statues, enormous statures: with nothing similar throughout the entire Mediterranean. Between the eighth and ninth centuries BC, on this hill called Mont’e Prama, overlooking the mullet and bottarga lagoon of Cabras, something grand must have arisen. An unparalleled monumental necropolis. And its discovery can now rewrite the history of the ancient West. The excavations, which began on May 5, 2014, are restoring the footsteps of a population who did not leave written statements. They recompose the physiognomy of a culture that we know only from enemy reports or from ruins that survived erosion. At the beginning of the Iron Age, Sardinians had to be so rich and powerful that they could commission a “Heroon”, a sepolcrale tomb tied to the cult of a hero, more majestic than any other known during the same period in Italy or on the Greece coasts. To admire similar splendors you have to go to the distant East, beyond Syria, in Iran or in the Caucasus. Or, you can stay here, in this corner of Sardinia, keeper of a secret that offers more mysteries than certainties. 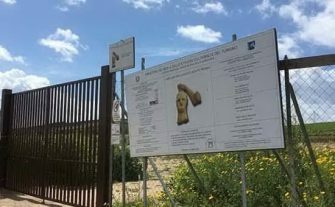 It is this heroic necropolis that over 35 years ago the University of Sassari and the Superintendency of Cagliari and Oristano started digging, on the trace of discoveries. Thanks to a tractor collision against a warrior bust, in 1974, in fact, archaeologists found a dozen underground tombs. While unearthing the first Giants, they identified the road that once passed between the statues. From the archaeological work site in the 70’s, 16 boxers carved with a small dagger hidden in the glove and a big shield held over their heads; six soldiers, represented frontally with a spear at their side and a helmet from which two long horns sprout; and six archers, with a quiver on their shoulders and a bow in arms emerged. With them 13 betili (single blocks of stone similar to a menhir, up to 2 meters 30 tall) and several nuraghe models also emerged. Then, silence, for thirty years, during which the limestone giants have been restored, studied and are now on exhibition in two museums in Cabras and Cagliari. In the spring of 2014, new searches began, not only confirming, but enlarging the scope of the findings. And in September, two twin statues appeared. The last giants would be two priests and they have a great shield coiled around their left hand, with their right hand wrapped in a tight fist. Not far from the site of the excavations, next to a dolmen, a well that contained a large quantity of seeds dating back to 1200 BC was found. After careful analysis, archaeologists have determined that the seeds are grape and melon seeds, testifying the ancient agricultural culture of the beautiful and fascinating Sinis territory.